“Apparently We’re Not Fish People” is the title of my finished ceramic aquarium piece in the photo above. It’s all ceramic except the actual glass/plastic aquarium. You may remember my earlier posts about making ceramic aquarium gravel. It was for this piece, and not a live aquarium! Since those posts, I’ve made the super funky retro diver, the precious merbaby, and wrecked columns, the small Asian boat, rocks, shells and logs. Also the Japanese pump box, old school heater and cord, Tetra Min food cannister, Ph test strip bottle and Ick Rid sample envelope. It’s all done in time to travel to the California Conference for the Advancement of Ceramic Art (CCACA, pronounced SEE-KA’-KA) in Davis, CA this weekend. 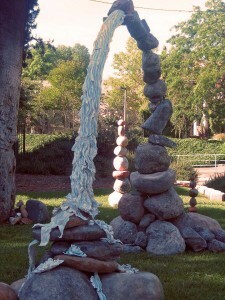 It will be a small part of Cabrillo College’s outdoor installation entitled “Hard Times.” Photos of THAT coming soon. I’m completely taken up with the rest of the preparations for not only the Davis conference, but for my first foray into selling my work at an outdoor ceramics show and sale with the Santa Cruz Clay folks at Bargetto Winery in Soquel. It’s packing and pre-packing all the time now…..Day trip to Davis Friday, then Saturday and Sunday in my booth in the Santa Cruz Spring sunshine. So, off I scoot, leaving you with one more view of my latest narrative sculpture. Notice I only said How and not Why. 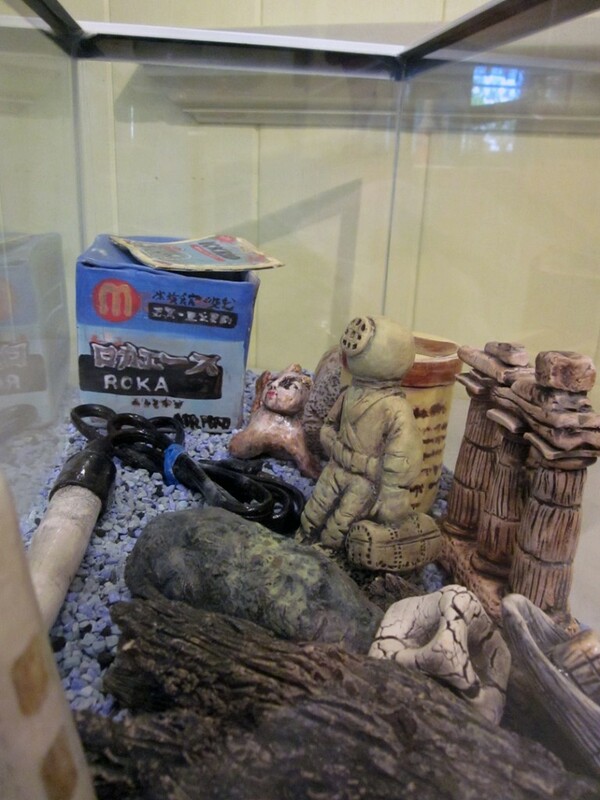 If you’re thinking of real gravel for your real aquarium, the Why becomes problematic. Why do that when it will take a full workday plus overtime to grind enough gravel to fill a ten gallon tank to two inches? Why ever do that when there are unknown toxicity issues with underglaze and oxide colorants that your prize fish may demonstrate by dying on you? No, this gravel-making is a completely sculptural endeavor of my own device. It’s one item of many spurred by the Cabrillo College Ceramics Department’s proposed installation at the annual California Conference for the Advancement of Ceramic Art held in Davis, CA at the end of April. We’re following up our fantabulous 2010 Cabrillo Rocks Portal installation -pictured above – with a life-sized out-on-the-lawn trompe l’oeil ceramic Yard Sale! Folks are right this minute working on fishing gear, globes, games, toys, linens, shoes, hats, bags, skateboards, dolls, a bake sale and then whatever else we can concoct between now and then. 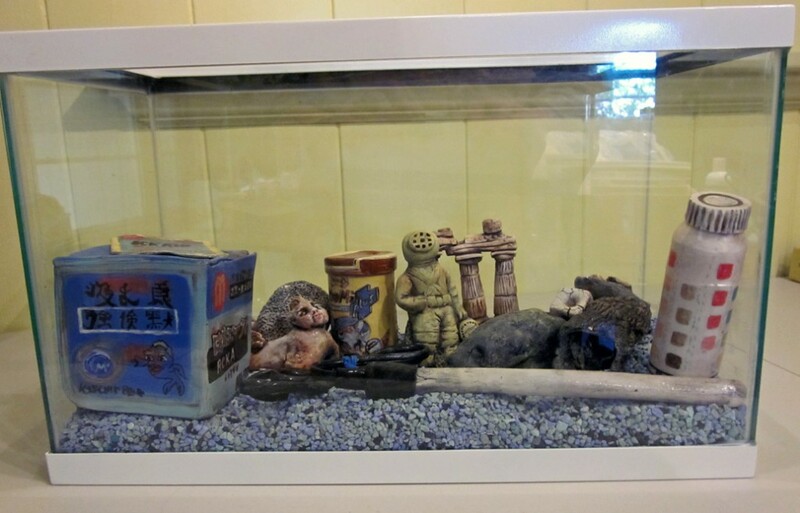 I’m offering a used aquarium set-up: a real aquarium with clear glass, but with the frame painted white (like all our tables, shelves and props will be) and everything else in it ceramic. I plan delicious tongue-in-cheesy mermaids, sunken ships, broken Greek columns…along with faux warped and stained cardboard boxes containing the pump, heater, filter, and canisters of fish food, medicines and a net. A complete mock set-up! Just needs fish and water. $30 OBO. Hence the gravel. It’s important to the faux-y integrity of the piece for me to make my own. But HOW???? 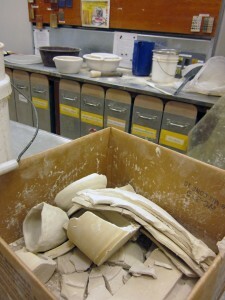 My first approach was to bust up bisqueware with a hammer. Too hard. Too sharp. Too uncontrollably uneven. It’s much easier to chunk up potato-chip brittle bone dry clay – which is essentially “dust held together by memory” according to one wise kiln tech I have known. 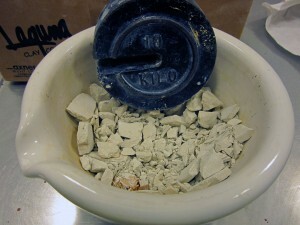 I used a mortar/pestle in the clay lab, but started with the densely heavy 10kg weight as shown below. 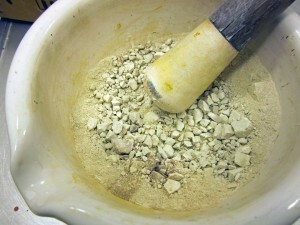 Then came the pestle which got the pieces to a mix range of pure dust to pea gravel sized. Next, a trip through a series of fine to coarse strainers and meshes straight out of my kitchen. Put the gross chunks through a fine sieve to get rid of the dust and too-teensy bits, pour what’s left onto a pizza screen and shake. The perfect size falls through! 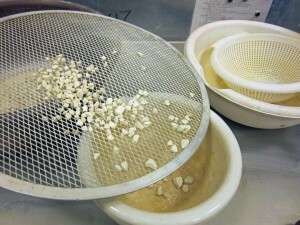 Continue to crunch up the leftover big pieces, then sieve, screen and shake a few more times. Sieve the inevitable dust out of the desired gravelly size and collect in buckets until there is enough volume to acceptably fill the tank. Plan on around ten hours of this in order to have enough volume, factoring in the clay body shrinkage. Also factor in sore shoulders, upper back and arms, temporarily-impaired hearing from hours spent in the drone of the glaze room’s exhaust fan, and the gag factor from wearing a particulate mask until the creases in your face are nearly time-worn. All pretty unavoidable. I’m pleasantly aware that making gravel this year is an act of “decomposition” regarding last year’s rocks and am lovin’ the strange parallel. In the next-related post on this topic: garishly coloring this gravel and making tired boxes and whatever else has come up.